"You're not buying an unnecessary electronic device, you're buying a family." David Letterman, The Late Show, CBS, April 1, 2010. This is the Apple.com' homepage as of today Monday 24th of August, 3:00PM CET. Just the confirmation of the official launch date of Apple's Mac OS X 10.6, which most of us already knew thanks to the rumor mill. What's interesting to me is the name of the picture (which you get when you download it) : "Hero_OSX". Somebody' s going to save the Cheerleader here ? You know your product is reaching Mainstream when you see it on 4x3 ads in the streets. Back at home after being on the road (and in the air, and on the Southern Alpes slopes), I took a couple of hours this morning to watch the recent introduction of the iPhone SDK by Steve Jobs and his fellow Apple execs. You'll get a flavor of the impact of the iPhone Software Roadmap by reading those two articles, from David Pogue for The New York Times here, and Mike Elgan for ComputerWorld here. Quote Master Pogue : " iPhone 2.0 will turn this phone into an engineering tool, a game console, a free-calls Skype phone, a business tool, a dating service, an e-book reader, a chat room, a database, an Etch-a-Sketch…and that’s on Day One." To better understand why the iPhone 2.0 is THE Revolution many of us were waiting for, just watch Scott Forestall, VP iPhone Software, demonstrating one of the most exciting new features of the platform, based on the built-in 3D-accelerometer : undo a photo edition by... shaking the iPhone (demo starts at 39:30). After seeing this, you'll get a better picture of Apple' s Hardware roadmap : the next gen iMac will be multi-touch based. 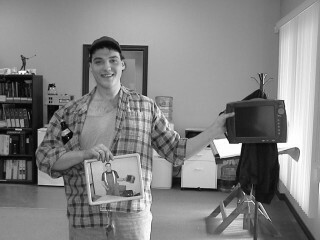 Then, you'll agree with Elgan : the iPhone will change the PC world, forever. "An Apple iPhone or iPod Touch will become a central part of Abilene Christian University's innovative learning experience this fall when all freshmen are provided one of these converged media devices, said Phil Schubert, ACU executive vice president. 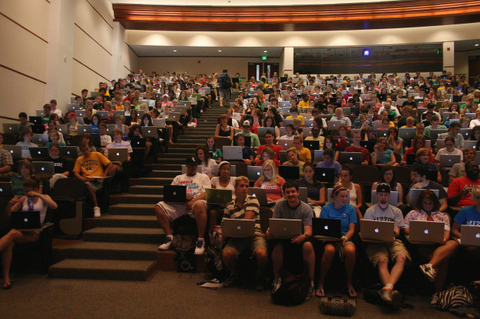 At ACU - the first university in the nation to provide these cutting-edge media devices to its incoming class - freshmen will use the iPhones or iPod Touches to receive homework alerts, answer in-class surveys and quizzes, get directions to their professors' offices, and check their meal and account balances - among more than 15 other useful web applications already developed, said ACU Chief Information Officer Kevin Roberts." Full description of the project by the ACU here. As a presenter who like to travel light - I'm a bit tired of opening up my laptop at each and every security check in the airports (even if it's a MacBook), I'm currently testing a new way to rehearse and do presentations whilst on the road (or in the air). 7. check the availability and integrity of all those files (takes a few minutes only). a) access the slides from anywhere in the World, thanks to the Web 2.0.
b) download the PDF onto any PC or Mac once on site. c) review the slides on my iPhone. The latest proves to be the most interesting part of the experiment. For instance, I can rehearse my presentation in the airplane, without needing to grab my MacBook. Also, I don't fear intrusive eyes from the guy next seat, see what I mean ? Just a side note : I've bought a MacBook this afternoon, as my good 5-years-old-400°C-fire-resistant PowerBook G4 just went off (seems the graphic card needs some repair). Not the Air (as the latest Apple marvel is a bit too expensive for me at the moment), but a nice white 2.2GHz CoreDuo. My new companion was up and running in less than 3 minutes, including online registration at Apple.com. I created a partition for Windows, of course; it took a couple of clicks, and boom, the thing was okay - live, of course. I set up my printer : less than 30 seconds for MacOS to a) find it, b) find its driver, c) select it as default. Then I got all my files back, thanks to TimeMachine. post-scriptum : today is a great Mac day, as I also got my iMac DV SE back - from a friend of mine who don't need it any longer. Guess what : this jewel is 10 years old, and it runs like just out of the box. Here's a modern, innovative way to do the exec summary of an event. See Mahalo Daily' s Veronica Belmont funny video : Steve Jobs' MacWorld Keynote in 60 seconds. Boom. Gorgious. Incredible. Since I bought the iPhone two weeks ago, people don't stop asking me questions about it. To make it short, they all go "wow, unbelievable !" first, then they ask me the question about the pricing : "how much is it ?". I then demonstrate the key features, i.e. the phone, the iPod, the web browser, the email, the camera, playing with the MultiTouch UI. Most of the time, this short demo is enough to convince the guy that 399€ is a fair price for such a jewel. However, sometimes the guy goes "well, you may need it for business to spend so much money". I totally agree. The iPhone is THE perfect tool for new innovative businesses. Twice over the last week, I've been showing the iPhone to prospects - read : target customers for the consulting & training business I'm setting up. I simply explained which kind of new support and assistance services the iPhone could enable (for instance, how YouTube can be used for online training). Each time, I got the same reaction : "give it to our people, and you'll get the business with us". Beyond that kind of new services based on existing/simple/standard features of the iPhone, you can create new ways of dealing with a problem, means you can create new/innovative solutions for your customers based on the iPhone. Watch this, and you'll get the picture. Here's the snapshot of the Dashboard' widgets that I've just created a couple of minutes ago, thanks to Safari 3. 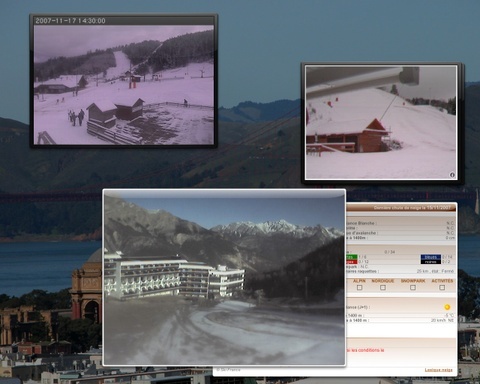 The story : with the Ski season opening this week-end, I like to watch my favorite ski resorts's webcams at least twice a day, so I can better plan my journeys on their slopes. Problem : there are three domains in the Vosges, plus two in the Alpes : the one 'close' to my office in Lyon, plus the one where we're going to spend a week next March. That is : five different websites, with at least one webcam stream each. Let those streams open in your favorite web browser all day long, and you're going to face some memory issues after a while. As I want a quick & easy access to the webcams, launching a tab or a window each time I want to watch them is not an option. Solution : Apple' s new Dashboard, which comes with MacOS X 10.5 'Leopard'. Open the resorts' s websites in Safari, go to their respective webcams page, and simply grab the stream with the embedded widget maker. Boom : in less than 30 seconds, you've got your favorite streams in the form of simple, easy to access widgets. Now, I just move the cursor to the appropriate hot corner of my display, and boom, I get the images, live. Plus the snow reports. Couldn't be more easy, right ? On Wednesday night this week, I've ordered a 500Gb external hard drive plus a 512Mb memory extension for my lovely PowerBook on the AppleStore. Yesterday Thursday All Saints Day was a day off in France. The items have been delivered this Friday afternoon, and TimeMachine is currently backing up the whole internal hard disk. That is what I call *the whole product solution* : product + service + customer satisfaction. That's why Apple is a model. Just For Fun, Microsofties ! I just received my Mac OS 10.5 aka "Leopard" Install disk. I tell you, the packaging alone is worth the $129 : a gorgious hologram on the front cover, and another splendid one at the back, appearing through icons and apps' windows. At the back of the DVD holder, those simple words : "Designed and engineered by Apple in California". That explains everything. Design in first place, no "inc." after Apple's name, and California, not "USA". For those of you who still consider Apple as a small player in the Computing arena, go to Amazon.com and check the most popular items in Software section. A new type of virus, aka 'Storm', is infecting Windows machines all over the Planet since beginning of this year. Unfortunately, Storm is much more than a good old virus : it's a worm, a Trojan Horse, and a bot, all in one single piece of malicious software. In between 1 million and 50 million PCs are infected, as per the actual estimations. The bad news : Storm has been written by hackers looking for profit. Read the whole story here on Wired, by Bruce Schneier, CTO of BT Counterpane. I'm so happy to run a Mac. Ed. note : unfortunately, I must use a PC at work. 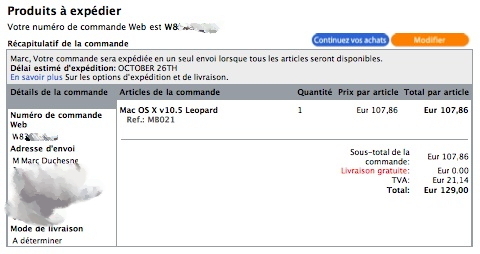 Just pre-ordered MacOS 10.5 "Leopard" on the AppleStore. I can't wait discovering my brand new computer. I mean, installing Leopard on my good 3-years old PowerBook G4 will be like opening up a bottle of Chassagne Montrachet white : a pure delight. Another photo showing lots of people. Who said Macs don't make it against Windows ? "Think Different" ? Yup, Think Different ! Shares of Apple Inc. today surged $2.869, or 1.87% to close at $156.339 on volume of 29,819,361 shares to set a new all-time closing high. In after hours action, Apple shares currently stand up $0.07 at $156.41. Apple's previous 52-week high was $155.00, set on September 26th. Apple's 52-week low is $72.60, set on October 11, 2006. At market close, Apple's market value stands at $135,958,804,299. For reference, Apple's market value exceeds that of Hewlett-Packard by $4,556,203,539, surpasses Dell by $72,467,192,999, is greater than Sony by $84,476,982,739, and tops the value of Gateway by a mere $135,256,357,339. I tell you what : I'm a bozo. Back in May 2003, I got a fairly nice severance package from my forever-beloved Agilent Technologies. During a couple of weeks, I hesitated putting to invest half of it into a bunch of Apple' s shares, which was around $23 at this time. Actually, I wanted to buy 1,000 shares. I did not. Now you understand why I'm a bozo. MacDailyNews article here, AAPL quote here. Just one day after the announcement of the iPhone price drop, Apple CEO Steve Jobs has posted an open letter to all iPhone customers on Apple's website. Read it here. That is pure Art Of Marketing. And another fantastic example of Apple' s focus on its customers. I wonder how many CEOs in the World would do the same in such situation : act, apologize, and explain. So, Skype' users have been unable to use their favorite peer-to-peer communication network for two days because of the... Microsoft Windows Update routine. Read the real story behind last week' massive disruption here. Okay, Windows is not directly involved : it was *just* a trigger in this case, which actually helped Skype to detect a bug into its network' self-healing process. Nevertheless, I can't keep thinking that without Windows the World would be a kind of better place. Hey, would you accept to get your car patched every single week ? According to Apple Chief Financial Officer Peter Oppenheimer at yesterday's financial earnings report, " there will be a product transition [he] can't get into." Apple now worth more than Hewlett-Packard. post-scriptum : to understand why this title, go here. Go to the 5:35 mark to enjoy Dave's understanding of webcasting, followed by the iPhone intro. Direct link to the iPhone stuff here on CBS website. Click on " Watch Video " under the " Dave's iPhone Sneak Peek 06.27.07 " title. New York Times' technologist David Pogue does great selling the iPhone. Henry * Fonzie * Winker was on Craig Ferguson' s Late Late Show to talk about the iPhone. Microsoft co-founder & Chairman Bill Gates and Apple co-founder & CEO Steve Jobs shared the stage last night at the fifth edition of D: All Things Digital , the Wall Street Journal’s executive conference . When asked what the greatest misunderstanding about their relationship was, Steve Jobs says "We've kept our marriage secret for over a decade." A joke maybe, yet most probably a pretty smart hint what's coming next at Apple : the takover of Microsoft. Hey, have you ever seen a win-win marriage those days ? * see here for explanation. 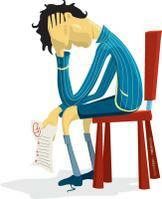 MacDailyNews contributor SteveJack reports his own encounter with Apple' s Customer Support. Quite a wonderful lesson for anyone building a Customer Care service. I wish I could watch " The Late Show " every single night. Because Dave Letterman is just the best. view this video directly on YouTube : here. Koloroo today announced the release of the first widgets that run on any iPod with a color screen. TipKalc is an easy-to-use tip calculator with instant check-splitter and KolorWheel is a color utility that provides scientifically formulated color schemes to match a web page, home decor, shirt or outfit ... in fact, just about anything. Both widgets can be loaded onto an iPod from either a PC or Mac and are available at an introductory download price of only $4.99 and $7.99 respectively. My take : now I can start developping an OTDR for the iPhone platform. Two weeks ago, the Wall Street Journal posted a freaking good article on "How Steve Jobs Played Hardball In iPhone Birth" with Cingular (now AT&T). Shall you have only 30 seconds before you, you can get the flavour of this article by reading the Quoted section here in one of my favorite daily newspapers : Good Morning Silicon Valley. I ain't comment on the iPhone' s multi-touch user-interface enabling a new revolution (it's well done here ), Steve Jobs being a genius (read here and here) , or Apple playing a giant chess game against Microsoft ( here, here, and here - and more). Usually, carriers catch more than a glimpse of the products their handset partners are working on. They get to provide input on what applications or features might make the device more marketable. Not this time. 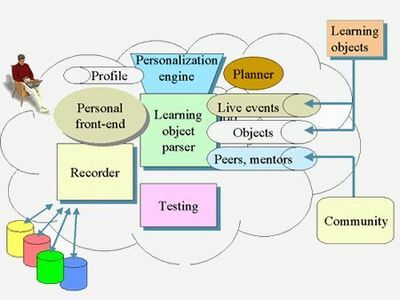 Several small teams within Cingular worked on the project, but each handled its own specific task without knowing what the other teams were up to. Employees had code-names for the project to avoid mentioning Apple by name, says a person familiar with the matter. Cingular sent a team of technical personnel to Apple's offices to test the device, making it sure it would work on the carrier's network. That rigorous process is normal for the release of any phone. But this time, technicians weren't allowed to handle or see the actual phone. Instead, they were given access to a dummy version that would only allow them to do the necessary network tests. At this time, we were to develop a brand new product, strategic for the future of our business unit. 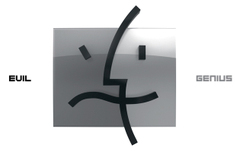 As a member of the Apple Developper Connection program, I was used to the methods the Cupertino firm put in place for Mac OS X (the 10.0 release) : regular beta seeds, beta testing program, feedback collection, etc. Hence the idea to use the same process for our new product : create a beta testers community, send them each new build of the firmware, get them engaged with the product development timeline, etc. Unfortunately, we couldn't implement this program : our product didn't run under MS Windows or any of the commercial OS at this time (not speaking of Linux or Mac OS : the Test & Measurement industry is living in a MS Windows world...). So, we were simply unable to get people outside of the company to test a single line of code. Kind of Mission:Impossible made really impossible ! Today, the landscape is totally different. The emergence of the Web 2.0 has changed the way we can develop new applications, even those to be implemented onto a fiber optics test handheld. Design your app as a Web-based one, and you're done : APIs, widgets, snippets, etc. It's all there, available, and easy to deploy, test, and use. That's what Apple did with the iPhone, by the way : consider each function (e.g. phone, internet, camera, etc.) as an application per se, then consider it as being called as a widget... Assign one guy or one team per widget, and you reach the ultimate secrecy level : nobody will know where this stuff is going to be implemented, and how it will be used ! 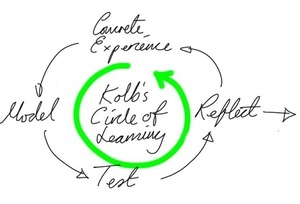 Actually, I will use this proven method with the developments at Testing 2.0. 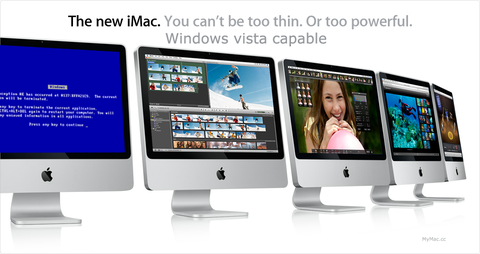 Are You Windows or Mac ? 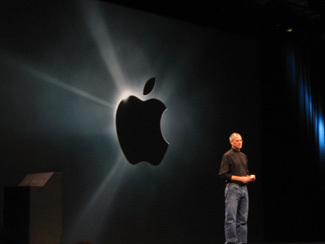 Apple Computer, inc. is dead, welcome and long life to Apple, inc. For all of us Mac fans, as well as for the rest of us entrepreneurs and business developers, the MacWorld 2007 Keynote is worth watching again and again. Of course, Tuesday the 8th of January, 2007, will stay forever as the day when Steve Jobs unveiled his best-kept-secret new baby : the iPhone. It is not that often (unfortunately ?...) that we can watch a new revolution live. But there was something way more important than the iPhone itself this day. Apple has changed. 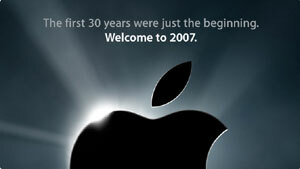 The ad banner which was released on the apple.com homepage the week before the expo tells this : Steve Jobs has set his company for the Future. Apple has dropped the word 'computer' out of its name, to make it crisp and clear to all of us, especially to its rivals Microsoft and Sony : the Mac & iPod maker is no longer a 'computing-only' firm. Apple is aimed at Consumer Electronics at large. Another interesting fact to analyze : Apple is no longer a single-combat-warrior/free electron company. Apple do teamwork. See Intel, Nike, and now AT&T. In each case, a beautiful example of a perfect win-win setup. Thanks to Jobs, and the Apple folks, Intel is learning to think out of the box, Nike reaches the high-tech geeks, and AT&T will be #1 again soon. 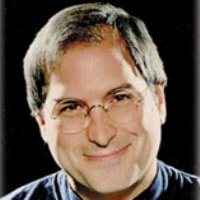 Les Poven of Of Things Mac has written a very interesting article on Steve Jobs and Change Management, detailing the Keynote speech in all aspects, from a strategic marketing perspective : "The 2007 Jobs Macworld Keynote: Lessons in Change Management". A must read.